We are located to the east of Loudon, Tennessee. Drive to our location by taking I-75 South to exit 76-East to Route 11 South, turn east at Viskase Plant 2/10 mile. The Loudon location serves central Tennesee including the cities of Knoxville, Chattanooga, Gatlinburg, Johnson City, Bristol and Kingston. 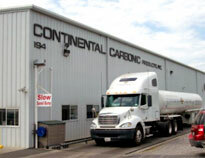 Continental Carbonic Products, Inc. in Loudon, TN is one of 46 locations in the U.S. and Canada where you can buy dry ice in both cut block and pellet form. Continental Carbonic offers the highest quality, food grade dry ice in the industry.